. It always amazes me at how many and how large the waterfalls are here for such small catchment areas, I suppose it’s logical given the amount of rain and this area was rich in waterfalls of all shapes and sizes. The next day saw us beaten again and we turned back at almost the exact same spot as the day before but this time sought refuge in Caleta Greenpeace; which I rate as a superb anchorage, great shelter, no woollies, good holding, nice scenery. We just stayed overnight and pressed on the next morning reaching Caleta Apala a small anchorage on Isla Samurez. We stopped late and continued at first light but didn’t get far before we were fighting the usual enemy so pulled into a little cove behind Isla Rule to shelter and dropped the hook to have lunch. The cove we had anchored in had been used by the ‘Cholgas smokers’, fishermen who collect and smoke the large blue mussels called Cholgas. The camps are just a simple frame of branches covered with bits of tin and polythene bags. You can usually spot the camps by the huge mountains of cholgas shells. Most of the good and many bad, anchorages have camps in this area. The fishermen would have come from Puerto Eden. Not many look used these days but some certainly are. After lunch the wind dropped and off we went only for the wind to pick up again. We battled on for a little while then called it for the day and ferry glided across the wind into Caleta Stella Maris. This turned out to be another Cholgas camp and we went ashore for a mooch, after mooring. There wasn’t much to see apart from the heaps of shells and barnacles; in any case it was raining like the proverbial so we didn’t mooch long. The forecast has been hinting at some improved weather and even some days without rain and the 20th March 2015 proved to be the first of several days without rain, the Sun didn’t appear until one day later though (when it did the radio net was full of people reporting how much blue sky they could see – for some, like us, it was the first for two months). We made good time and arrived in Puerto Eden at midday, stopping to talk to the NZ yacht “Sagitta” (who are heading for the Falklands as one of their stops) on the way in. We were met by an Armada NCO in a zodiac who said he would be over to check the papers after we anchored. We anchored in front of the little village which consists of around 40 houses and is home to around 250 souls including the last of Kaweskar Indians. Upon anchoring the boat was immediately visited by a humming bird and bumble bee, the humming bird was as small as the bumble bee or the bee was as large as the bird; either way they were about the same size. 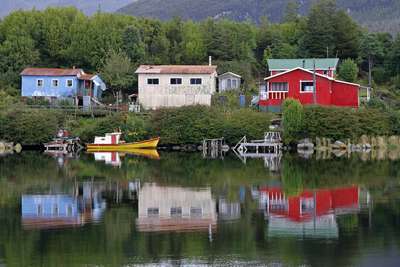 The Patagonia and Tierra del Fuego Nautical Guide is rather unkind to the Kaweskar (Alacaluf) Indians; “Life is no longer of interest to them and they kill the time strolling like zombies along the boardwalks of the village”. The boardwalks are of note; there is no street, no cars, just a raised wooden boardwalk that connects the houses meandering along, more or less, following the shoreline of the bay. The wood is of course damp and slippery and often covered in mosses or green algae and in places quite treacherous the vigorous growth of the rain forest threatening to reclaim the timbers at any moment. We were able to buy some diesel by taking our jerry cans to somebodies hen run where they had drums of diesel which they measured out using a very dodgy measure as our cans took rather more of their litres than they do normal litres and paid double the street price to boot. We did not plan on buying fuel but the persistent bad weather and head winds meant that we had burned more than planned and made it prudent to get in a little reserve. We bought a few things at one of the little supermercados; potatoes, onions, instant coffee, eggs and powdered milk. A friendly scallop diver invited us into house for ‘onces’ with him and his wife. He has been diving for shellfish all his life starting in the old hard-hat days spending up to 8 hours a day in the icy water where the glaciers calve collecting scallops, now he has a surface supply (a tool compressor feeding his homebrew regulator). We couldn’t work out his age, he’s probably no more ancient than I am, but the hard life shows. Flour being something we couldn’t get and bulldog grips being something he couldn’t get; he gave us a huge bag of flour in exchange for a couple of bulldog grips to repair the steering on his boat and we left with his phone number after being made to promise to call when we reached civilisation. The Armada officials had visited the boat and we arranged to visit their little outpost, half a mile across the bay from the village, the next morning to have our ‘Zarpe’ stamped. Everybody was very friendly and helpful, they don’t get than many visitors I guess. Awakening to a bright morning and a blue sky the next day was a real treat and we got up the anchor and moved over to the Armada buoy in shirt sleeves! The Zarpe was duly examined, checked with Valpariso, and stamped. We were also advised that as were still in-navigation on our original zarpe, now extended until the end of April, that we did not have to get our visas extended until we arrived at our destination port (Valdivia), or of course if we happened to visit a town that was a port of entry. This has taken some pressure off us as we now have no need to rush to perform that formality. The Armada NCO dealing with us collects foreign coins so we searched our pockets, wallets etc.. but could only come up with a US Dime to add to his collection. Slipping the buoy we motored in mirror calm channels and brilliant sunshine (this was more like it) northwards through the notorious Angostura Inglesa an narrow twisting channel with tides of up to 6 knots that we managed to catch just right entering the pass with about 2 knots against and leaving with about 2 knots in favour. In early evening we passed the wreck of the “Captain Leonidas”, a large steamship sitting more or less on her marks on reef. I took a lot of photos and some of them make her look like some dreamlike ghost ship. I don’t think a little compressed blog sized photo will do them justice though so those will have to wait. We anchored that night in caleta Yvonne and got the shore-lines made fast just on dark having made 35 miles. Another fine and bright morning saw us out in Canal Messier and making fine progress we had the wind behind and were sailing for the first time in two months. We made a fine 56 miles before stopping for the night in what looked to be the best caleta for the conditions and that was in reach. The wind was from the SE an event so rare that almost none of the marked anchorages or those in the guides provide protection from that quarter. Therefore we ended up in Caleta Lamento del Indio and spent a very uncomfortable night being buffeted by woollies; which meant a rather tardy start in the morning. However the day was fine and we stowed for sea as we now had to cross the notorious Gulfo de Penas (Gulf of Sorrow). We had a rather tricky un-mooring and anchor recovery manoeuvre to perform in a very tight and hazard dotted cove that we managed quite smoothly; I don’t think we would have been able to pull it off a couple of months ago and would have had to sit there and wait for better conditions. Once outside the day was lovely but a bit lacking of wind for a fast sailing passage; we were not complaining. After trying many different sail combinations in the light conditions we gave up, reefed the main to stop it slatting, and motored on over glittering calm seas with an incredible view of the ice capped mountains away to our East stretching north and south along the Andes. We rigged a fishing line as our friend in Puerto Eden had told us that we could catch some kind of tuna in the Gulfo which had a penchant for red lures; so far they don’t like our red and white lure, but we did get one bite just at sunset. By nightfall we had crossed the Gulf and were off Peninsula Tres Montes carrying on overnight we passed a peaceful night under a completely clear sky which really sprang to life when the sliver of moon set an hour or two after the Sun. We saw numerous whales during the day, some a bit too close and a pod of 10 Orcas, there are a lot curious large luminous green blobs in the water up to about 1.5m across but we have no idea what they are, some kind of colony animal maybe. Today we are still plodding along with a light breeze right up the jacksie and are motoring with the main prevented right out (I have to get a new spinnaker pole and some rigging for it before we head across the Pacific). Currently we are off Peninsula del Taitao closing on Peninsula Skyring. We won’t arrive anywhere useful to us before dark so will continue on up the coast and plan on entering back into the channels via Canal Darwin tomorrow sometime; unless of course we suddenly get some breeze or current and can make Bahia Anna Pink before sunset. Glad you’re having good weather. Up here in II, III & IV regions, towns are getting washed away in 100 year floods…. Most of La Serena still has running water shut off because of difficulties at the collection and distribution plant.